Snow in Vermont...LOTS of snow! S N O W and LOTS of it! Ski or ride Okemo, Stratton, Magic, & Bromley mountains; all within a 20-minute drive of Inn Victoria in the Okemo Valley. Snow shoe along the Lost Mine trail in Chester, or ask us what trails in the area are in good shape. Snowmobile the hundreds of miles of VT trails; rent your snowmobile sled from Snow Country Snowmobile in Proctorsville, just a ten minute drive from Inn Victoria. 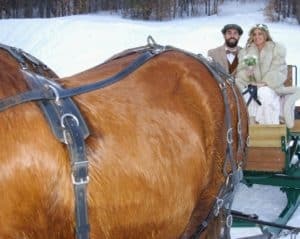 This entry was posted in Chester, Okemo, Romantic Getaway, Romantic Inn, Romantic Vermont B&B, Ski Vermont, sleigh, sleigh ride, Uncategorized, Valentine, Vermont, VT by Penny & Dan. Bookmark the permalink.